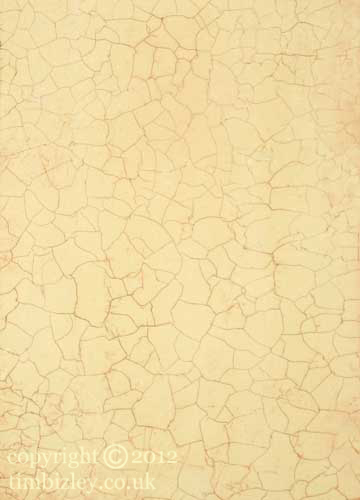 This craquelure paint effect is reminiscent of the fine eggshell crazing that occurs on old varnish layers and paints where different rates of oxidization and drying between the layers cause stress cracks to appear on the surface. The prime example is the surface of old oil paintings where the fat over lean principle has broken down in some respect. In this faux example the craquelure paint effect is emphasized by wiping the surface with pigment which remains in, and displays the cracks. One of the most notoriously difficult paint effects to control so as to achieve the required size of crazing. Variable factors such as humidity, temperature, thickness and timing of application of the craquelure on the partially dry underwork all affect the process whilst drying time in itself has its own input, often modified by the use of technologically advanced blow drying equipment such as the hair dryer.